This article written by Sri. C.G Nagaraj (Retd. Head Master of DMS) featured in Star Of Mysore on 15th September. It was a very pleasant morning on 7th December 1965. 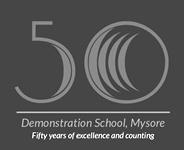 The staff and the students of Demonstration Multipurpose School (DMS), attached to the Regional College of Education, Mysore (RIE), had a very important function to attend in their school premises, which is also the campus of RIE. It was the visit of the great Teacher of our country, the then President of India, Dr. S. Radhakrishnan. The writer of this article was a Teacher in RIE at that time and was assigned to teach in DMS, a school attached to the RIE as a laboratory school for innovative practices. We the staff and the selected students chanted the shloka in front of all the dignitaries including the President of India, Dr. S. Radhakrishnan. The moment we finished the prayer, the President asked us to sing again. He listened to the rendering carefully and asked us to include one more line and to our surprise he said, ‘sing along with me.’ It was such an excitement to all the people in the open-air function of planting a sapling, we readily joined him. He told us to write down and added one line in Sanskrit to match the shloka. He added on the spot a line which included the names of Jesus and Mohammed. The shloka now reads as shown in the box below. It is almost 50 years now since this event took place. What an intellectual he must be to add the most secular phrase to our epic shloka ! Today, Regional Institute of Education maintains the spot where our President stood and sung the shloka at the park and a gardener maintains it since the past 49 years. Every year Teachers Day is celebrated at this spot in memory of Dr. Radhakrishnan and the students of DMS sing the amended shloka as school prayer daily. As an educator and a Principal of Schools, wherever I worked I introduced this shloka as school prayer. Some of the old photographs show the tree that was a sapling of a few inches. It has now grown to a huge tree and stands majestically, singing the same Prayer in silence, heralding the spirit of secularism of this country. I am very grateful to my colleagues of RIE who assisted in getting some of the photographs from the library. 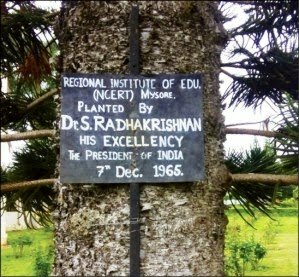 I am grateful to Rekha and Sharada who were students of RIE in 1965 and a team member of the singing group, Shivakumar, a crafts teacher who carved the bust of our late President to install at the spot where the sapling has now grown into a mighty tree.